First cultivated in China, peaches are considered a symbol of immortality and friendship according to Chinese tradition. Low in calories, the soft and fuzzy peach is the perfect summertime fruit. It can be used in juices and salads. 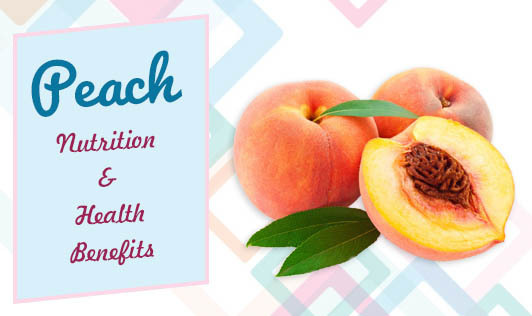 Here are a few nutrient facts about peaches and information on the health benefits it offers. A medium peach weighs around 75g and it contains 30 Kcal which is subdivided into 7g of carbohydrate (6g sugars and 1g fibre), 1g of protein, 140mg of potassium, and 8% of the daily value (DV) for vitamin C. Peaches are also a richer source of potassium. It is considered the perfect snack food for weight loss. A peach makes you feel full and keeps you from overeating. Peach only contains about 35 to 50 calories and no fat! It help fight obesity-related diabetes and other cardiovascular diseases. It contains vitamins A and C, which helps keep skin healthy, revitalizes it and makes a great natural moisturizer. This justifies its use in cosmetics. Peach reduces hair loss and soothes symptoms arising from fungal infections of the scalp. The fruit acts as a healthy stress reliver and helps reduce anxiety. In fact, peaches are often referred to as the ‘Fruit of Calmness’ in Hungary. Peaches- they are so delicious and nutritious that you should never miss an opportunity to have them whenever you get the chance. They can be used in jams, huices, and jellies. Sadly in India, peaches are not available all year round. So grab them as and when you find them.